These days the airport of Odessa turned into a natural NATO airfield that only just manages to receive and send military aircraft with staff and military equipment. The Odessa “patriotic” Dumskaya.Net publication, literally choking with delight at such proximity to NATO “saviors”, regularly publishes photoreports on these take-offs and landings, from which it is possible to have a certain notion of the plans of the alliance’s command. Thus, just in a week in Odessa the arrival of the following military plans of the alliance was recorded. U.S. Air Force S-130 military transport plane. Repeated arrivals were recorded. S-17 Military Transport Plane from Hungary participates in the transfer of NATO employees. But, perhaps, the most interesting visitor was the latest American distant anti-submarine Poseidon R-8 plane, which in general arrived in Ukraine for the first time. Here it is important to understand the following. In ordinary life these strategic “sea hunters” are based rather far from the territory of the former USSR – at the Italian air base Sigonella, which makes their every sortie to the territories of the Black Sea and, in particular, to the coast of the Russian Crimea a rather long and expensive action. Taking into account this fact, the location of the “Poseidons” on a stationary basis in Odessa, or in its vicinities, can significantly raise their operational opportunities for continuous control of this water area. 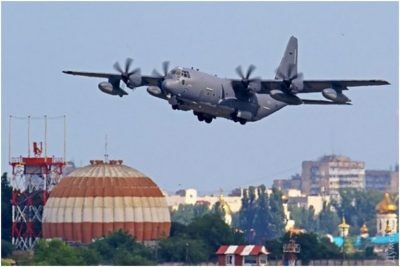 In this regard the unprecedented activity of the Kiev Ministry of Defence attracts attention, which literally goes all out in order to maximally increase the restoration of the former large Soviet air base in the city of Artsyz, capable of receiving all existing types of transport planes. It is obvious that the transfer of this airfield to the order of NATO will provide the alliance with a fully-fledged base for the solving of all complex logistic, operational, and tactical tasks in this theatre of military operations. Thus, Ukraine, legally without being a NATO member, actually continues to turn into a military outpost of this bloc, sharpened for use exclusively against Russia.